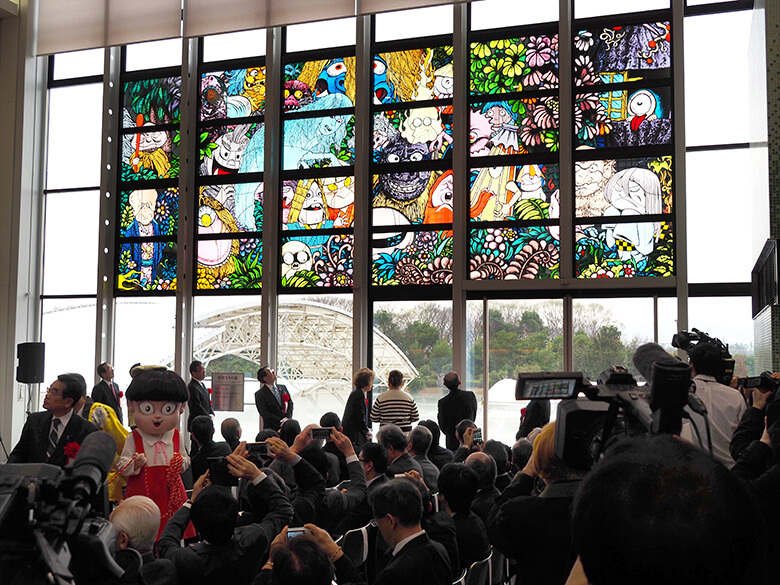 An unveiling ceremony of stained glass, original design was drawn by cartoonist Shigeru Mizuki, has been held on Tuesday, 8th of March at Yonago-Kitaro Airport, Tottori Prefecture. Shigeru Mizuki, whose real name was Shigeru Mura, known for his “GeGeGe no Kitaro” series depicting yokai, the spirits and monsters of Japanese folklore, died last November at age of 93. The stained glass, the title is “Yokai tachino mori” (Forest of Yokai-Monster), 2.8 m high and 10.2 m long, has been placed at second floor of departure lobby of Airport. The governor of Tottori Prefecture, Mr. Hirai, and other guests from the political and business circles of Prefecture attended the ceremony, including Ms. Mura Nunoe, widow of Mr. Mizuki, and her two daughters. Mr Mizuki is the native the Prefecture. In his opening remarks, Mr. Hirai said “Unfortunately Mr. Mizuki died last November but here we can discover Mizuki’s world. Actually we have commercial flight between Yonago and Seoul. Flight between Yonago and Hong Kong will start soon. I expect many foreigners come to Tottori and enjoyed this beautiful Mizuki’s world”. Following an unveiling ceremony, staring at the work, Ms Mura said “I am deeply moved. If my husband were alive, he would be so pleased”. All the characters of Yokai-monster in“GeGeGe no Kitaro” appear in the stained glass as if they chat each other in the forest. This public art is planned by Japan Traffic Culture Association (JPTCA) and created by Atelier Creare Atami Yugawara, which studio is located at Atami City. Total of 6 craftsmen of the studio worked during a half year to complete this work. It is consisted of 85 colors and 2600 pieces of antique glass. 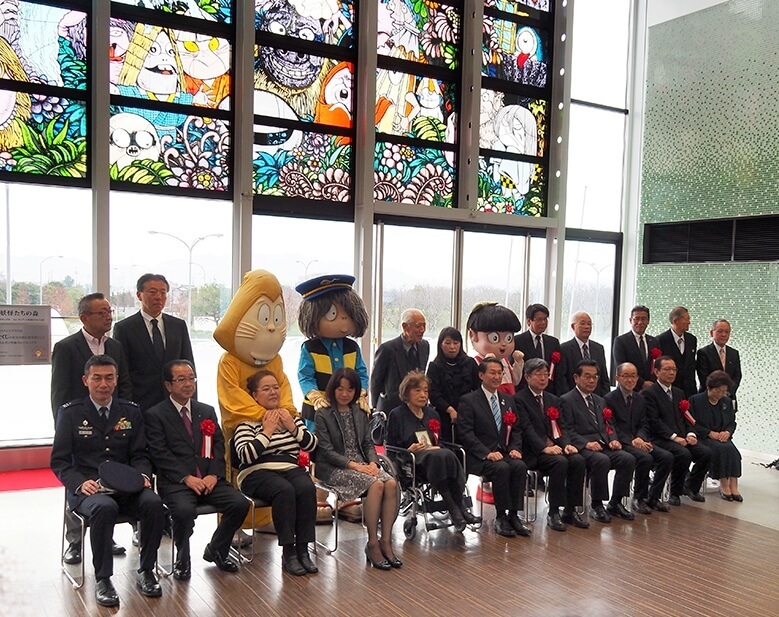 JPTCA promotes to install the public art throughout the country and Yonago- Kitaro Airport is became the 513th.